Rick Dykstra, President of the Ontario PC Party, arrives for a meeting to pick an interim leader to lead them into the June provincial election at Queen's Park in Toronto on Friday, January 26, 2018. The Conservatives are now ready to ask potential candidates specifically whether they have ever been accused of inappropriate sexual behaviour. The Conservatives are now ready to ask potential candidates specifically whether they have ever been accused of inappropriate sexual behaviour. Cory Hann, a spokesman for the party, says the questionnaire that anyone seeking to join a nomination contest must complete was updated Jan. 31. That was the same day Conservative Leader Andrew Scheer promised an independent, third-party investigation into how party brass handled allegations of sexual misconduct against former Conservative MP Rick Dykstra. 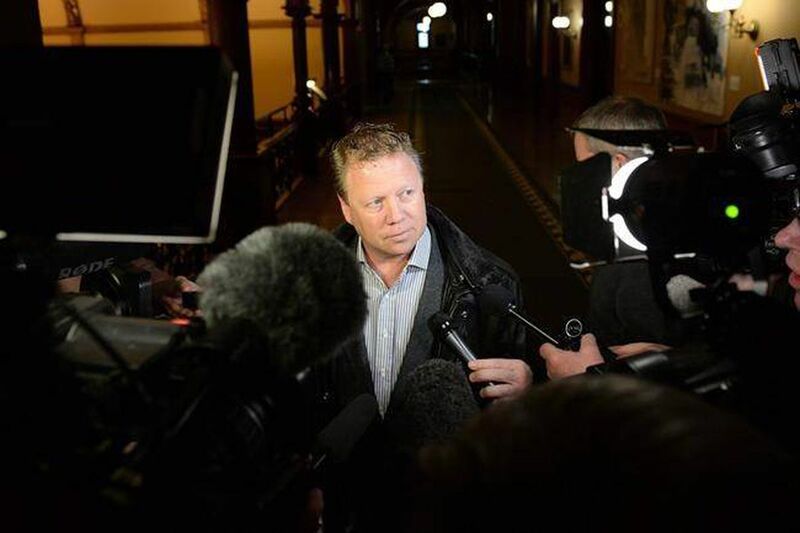 Last week, a report in Maclean's magazine said allegations involving Dykstra and a Parliament Hill staffer were brought to the attention of the 2015 Conservative campaign team, but seemingly resulted in no action being taken against the longtime Ontario MP. Two of the most powerful figures in the party at the time – former prime minister Stephen Harper and his then chief of staff, Ray Novak – have now acknowledged publicly they were aware of the allegations. Both said last Friday they allowed Dykstra to remain on the ballot because no criminal charges were laid. Dykstra, who has denied the allegations, ultimately lost his 2015 re-election bid and went on to become president of the Ontario Progressive Conservatives, a position he resigned shortly before Maclean's published its report. Patrick Brown, another former Conservative MP, is also facing allegations of sexual misconduct. He denied them before resigning as leader of the Ontario Progressive Conservatives last month. Mike Coates, who is challenging the nomination of longtime Conservative MP Cheryl Gallant in her eastern Ontario riding, said the vetting process he went through last year did not involve a question about sexual misconduct, but he would welcome one. "Why the hell not?" Coates said. "You want to make sure that all of your candidates are above reproach in whatever concern you might have, whether it's sexual relations with your employees or of financial conduct with your company," he said. "I think all of those questions are now fair ball." Coates said even if the question did not come up during the application process, he is now getting it as he campaigns to take on Gallant. "Do you have anything in your background that we need to know about?" is one of the questions Coates said a voter asked Sunday. "It was that direct," he said. "I've got that question now from others and I think it's a good thing that people are asking that question, because you shouldn't be running if you're hiding those types of skeletons – they're going to come out." Gordon Francis, who is seeking the Conservative nomination in the Edmonton riding currently held by MP Mike Lake, said the application and interviews he had to go through to enter the contest was already exhaustive, even without the new question. Francis said he was anticipating the interview to be like the one would have for a job, with some tough questions but mostly of a friendly nature. "That is not what unfolded," he said of the 90-minute grilling. "It felt more like I was being interviewed by a panel of senators on TV." Hann says the previous version of the questionnaire, which is part of the vetting process, asked would-be candidates whether they had ever been under investigation by a professional body for alleged misconduct, even if they were subsequently cleared. They were also asked if they had ever been under investigation by police, even if charges were never laid. Both of those questions remain, but the one explicitly referencing accusations of "improper sexual behaviour" is new. Hann says the Conservatives are still laying the groundwork for the third-party investigation, but that more changes could come once it's complete. "I think a lot will be able to be answered once we have those investigation results in hand," Hann said Sunday, adding that the probe's recommendations "will shape what we do as far as vetting goes." Hann said the party is currently consulting potential investigators on how the review should take place.